Suddenly I feel like an expert in family road trips. Even though I'm really not. But here are my tips, if you should choose to hit the pavement with small children in the vehicle. 1. Have lots and lots of activities to do. And then have more. 2. Have a "shush bag" in the front. It's a bag filled with shush toys. You pull out little surpises as needed when you need a certain 3 year old to shush. Dollar store items are great. Little books, pocket cars, bubble gum tape, new coloring pages, etc. 3. DVD players are awesome. It's well worth the investment before your trip. 4. Buy the kids a $1 photo album before you leave. Then at every stop let them pick out a post card. They'll end up looking forward to each stop, comparing post cards, and have a "scrapbook" of the trip when it's over. 5. 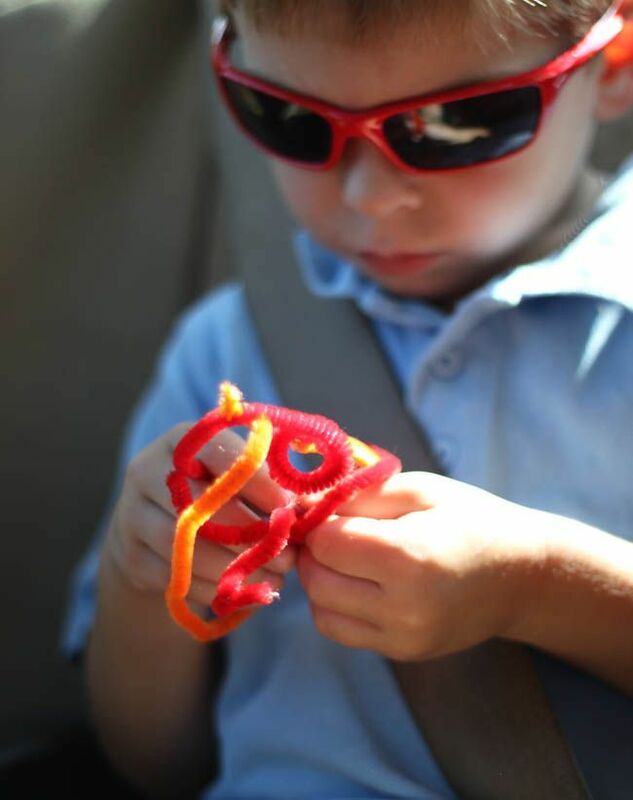 Pipe cleaners are cheap, quiet, and creative toys. 6. Deprive your kids of television for weeks before you leave so that they become engrossed in it at every hotel. This one wasn't intentional, but it worked. 7. Take a small cooler with ingredients for "lunchables" so you don't have to stop as often for meals. Crackers, sliced cheese, sliced ham, turkey, and pepperoni. 8. Water bottles and instant drink mixes eliminate the need for frequent soda stops. 9. Get a pack of glow sticks at a dollar store and pull them out for toys after dark. 10. When all else fails, try to collect license plates from all 50 states or play the alphabet game! p.s. What ideas or tips do you have? Share please! For younger kids....there is a great toy called an aquadoodle. It comes with a pen younfill with water. You can buy new pens at target. Buy a pack of the pens only. Combine it with a paint with water book. Ta Da! Painting in the car or at restaurants! My older son picks a postcard from each place and chooses a person to mail it to. Fun! A disposable camera is fun! Oh, and a trip to the bookstore before we leave for books ONLY for the car. You clearly did not ask for more ideas....I couldn't resist. That aqua doodle has saved us on the plane! I like the idea of the shush bag; really wish I would have thought of that. I think Moose would like pipe cleaners. And the post card game. I can't wait until they can play the alphabet game! Duct tape. Lots and lots of duct tape. I had to laugh--duct tape!!! Small bottles of bubbles for potty breaks or legs stretching time. Give each child a pocket size notebook and a "theme" animals, farms, car colors etc and they have to keep track in their notebooks. We have a version of the lunchables bag --ours is the "snack bag." Combo of healthy and not so snacks to eat in the car when you don't need or want to stop at that time. You should post the "postcard books" here so we can see them --it's a great idea for all families big or small. love the piper cleaner idea! and the postcard album. that one's pretty genius, too. Great ideas Beki! Love the pipe cleaners and postcard books. We do the postcard books too! I also make an activity book for each kid. They are filled with pages that are themed for our trip, such as a word search about the state we will visit. These books are laminated and bound. They get dry erase markers for the laminated pages. We also play "dead cows" where you are on teams and count the cows on your side of the road, a graveyard kills the other teams cows. First team to 100 wins. We also play an alphabet game, finding the alphabet in order on signs. The kids have digital cameras they use to make movies in the backseat with. We do not do DVDs or video games. They need to look out the window more. They do each bring a book. Our kiddos love to play "I'm thinking of an animal..."
They give one hint each time until a sibling guesses correctly and then it's their turn! We drove from Dallas to New Orleans this summer and we left the house at 2:30 so the Girls (ages 9yrs, 6 yrs, an 6 mos) Slept until the first stop at Mc D at the halfway point. Then they went back to sleep until we made it to New Orleans. On the Way back we couldn't leave quite that early so they played DS most of the way home. We take turns picking a music cd, this works over long distances. We haven't had complaints because everyone knows they will get their choice. And a confession, we get the Costco sized jar of jelly-belly beans and dole those out in little paper dixie cups. We do a lot of long distance driving trips and for our family this works. We've never resorted to movies or music headsets, just good old family sharing time. 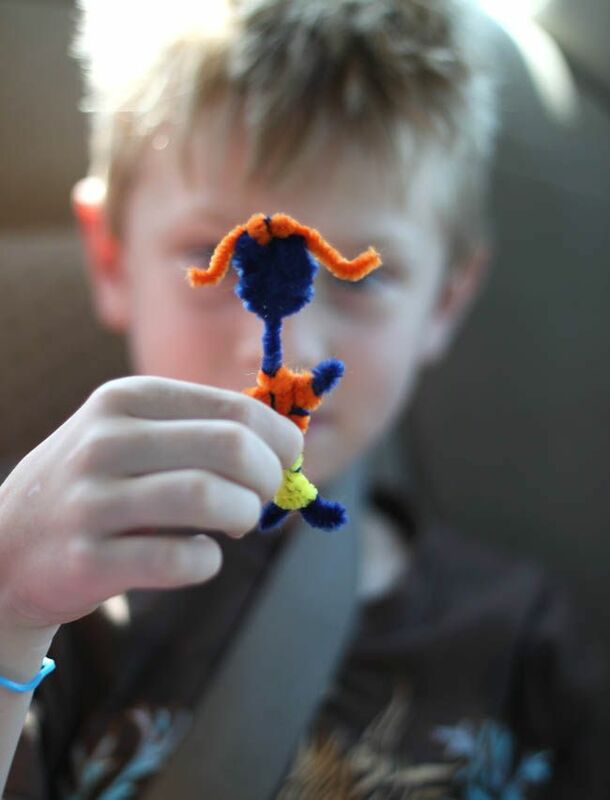 Pipe cleaners! I am gonna have to remember that when we bring our new daughter home from Serbia! she'll be almost 11 by then. Looks perfect...and quiet.